Low Torque (Easy turning - for quicker/easier Volume & Tone swells. 1/4" split shaft for fine-knurled (24-spline) US Spec knobs. Typically used on SG's, Flat Top Non Carved Top Les Pauls, PRS's, LP Jr's and many other models of guitars, but can be used on any guitar that requires a 500K Split Shaft Potentiometer. Emerson Pro CTS pots from Emerson Custom were designed to be the premium choice for the discerning guitarist looking for the optimum performance and tonal response from a guitar potentiometer. These specially designed Emerson Pro CTS feature a longer-life brass shaft and bushing. They also feature a tighter ±8% resistance tolerance compared to CTS products offered by most other suppliers. Each and every Emerson Pro CTS pot is hand tested to ensure that they meet or exceed our stated tolerances. We take great pride in offering some of the best, most consistent potentiometers on the market today. 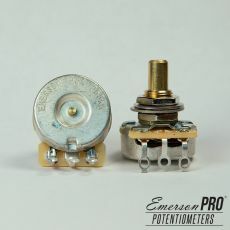 Emerson Pro CTS pots have a proprietary custom audio taper that was specially designed by Emerson Custom to give you a very smooth and accurate response when you roll up and down on the controls. These pots will give you a much more responsive taper than what you'll get with economy or even standard issue CTS pots. Crank your guitar up to 10 and the volume swells all the way—no abrupt flattening to choke your playing style. 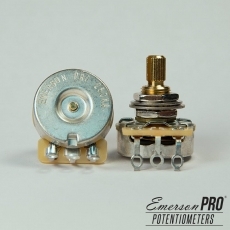 Clarity and Precision define this Series of Premium Potentiometers by Emerson Custom. Each Emerson Pro CTS pot includes a flat washer, lock washer, and two hex mounting nuts for custom height adjustment on a pickguard, control plate, or directly on to the guitars top from inside the control cavity.